The Well-being Health Center at Samitivej Srinakarin Hospital offers a complete range of healthcare services to help you be healthy from the inside out. 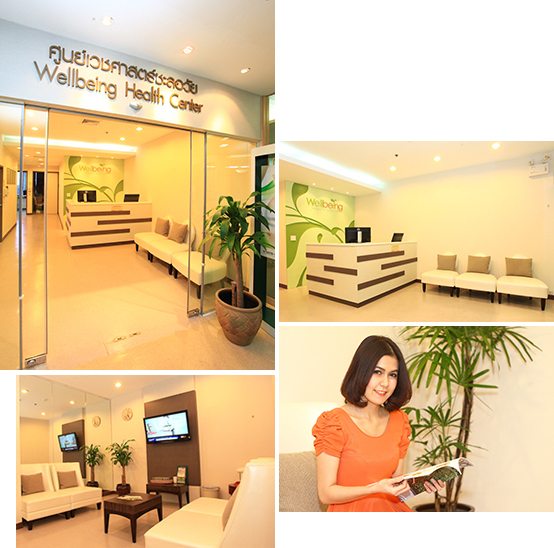 The center provides the best anti-aging care with advanced medical technology and customized programs. What is “anti-aging medicine”? Anti-aging medicine is used to promote good health – not only to reduce the effects of aging, but also to promote longevity in terms of mental and physical health, good emotional health, and naturally healthy skin. The services are delivered by a team of anti-aging and regenerative medicine specialists, laboratory clinicians and medical professionals who have been specially trained in anti-aging medicine. Measure oxidant/antioxidant levels to determine whether they are present in sufficient volumes to prevent body deteriorations and to counter the effects of oxidants. Create nutritional management and exercise programs in order to assess deterioration caused by improper diet and lifestyle, and develop diet plans and provide food supplements tailored to individual needs. Detect the presence of inflammatory cells and indicators that may cause chronic conditions such as diabetes, coronary artery disease, etc. Measure vitamin and mineral levels for nutritional assessment. Check up gene in order to faitor proper nutrition. Exercise management program, possibility of cancer, medicine allergy. Manage weight by determining why you may have difficulty maintaining your optimal weight. Create a tailored nutrient and supplement plan that incorporates the right balance of vitamins, minerals and antioxidants. Associate Professor Sompongse Suwanwalaikorn, M.D.